Across the U.S. today, homebuyers need to spend 17.5 percent of their monthly income on their mortgage payments, according to Zillow’s second-quarter affordability study for 35 of the country’s largest markets. The second quarter of 2018 saw mortgage affordability — the share of median household income needed to make median monthly mortgage payments on a median-priced home — jump by more than 2 percent from 15.4 percent at the same time last year, fueled by rising home prices and mortgage interest rates. That being said, mortgage interest rates are at relative historic lows and only starting to creep up, with more increases likely in store. And though still well below the historical average of 21.2 percent, the income-to-mortgage ratio has not been this high since 2009, in the wake of the financial crisis (leading up to it, the income-to-mortgage ratio spiked past 20 percent). 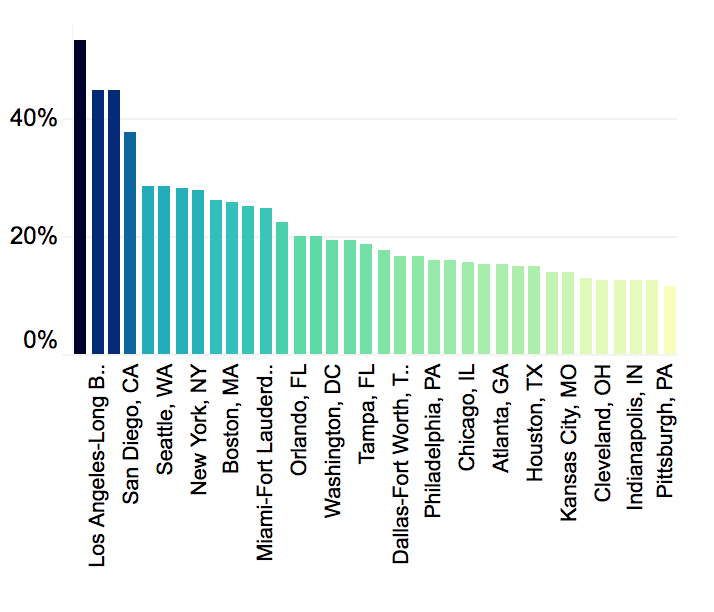 The West Coast has some of the most mortgage-saddled homeowners in the country — in San Jose, Los Angeles and San Francisco, households spend more than 40 percent of their income on their mortgage. For years, financial experts have advised not spending more than 30 percent of one’s income on housing for economic well-being. According to Zillow, incomes are just not able to keep up with the rising cost of a home (an average single-family property now goes for $285,700), which leads many to shell out ever-increasing chunks of their income on housing. The less you earn, the more of your income will go toward your shelter — in 2017, low-earning households paid 23.9 percent of their income on a mortgage while high-earning households only paid 12.9 percent. But even with mortgage payments chipping away ever-larger income chunks, it’s tougher for renters — across the country, they pay an average of 28.6 percent of what they earn on housing, and renters who fall into the lower third income bracket spent an astronomical 62.7 percent of their income on their corresponding lower-third median-priced home. 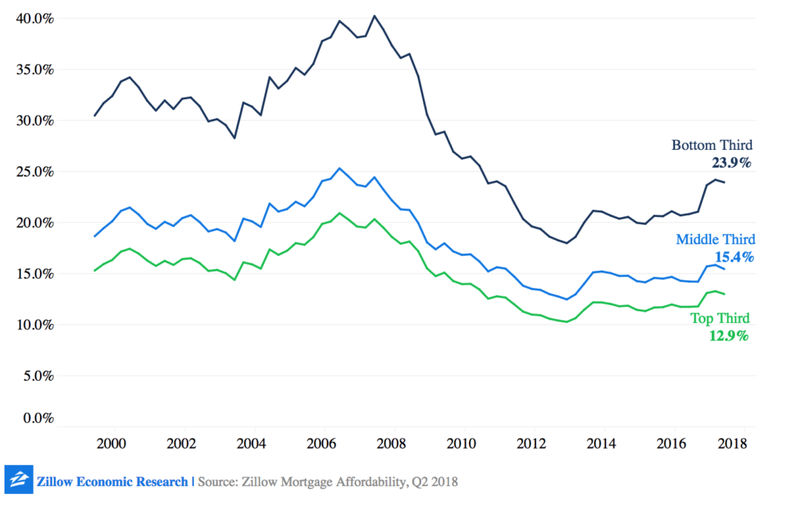 Such a market — in which high rents and growing home prices make the purchase of a first home increasingly unaffordable — locks many prospective homebuyers into renting indefinitely, Zillow has found. “Low mortgage rates have kept first-time homeownership and move-up homes within reach for many Americans, even as home values have soared to new heights,” Terrazas says in the report.